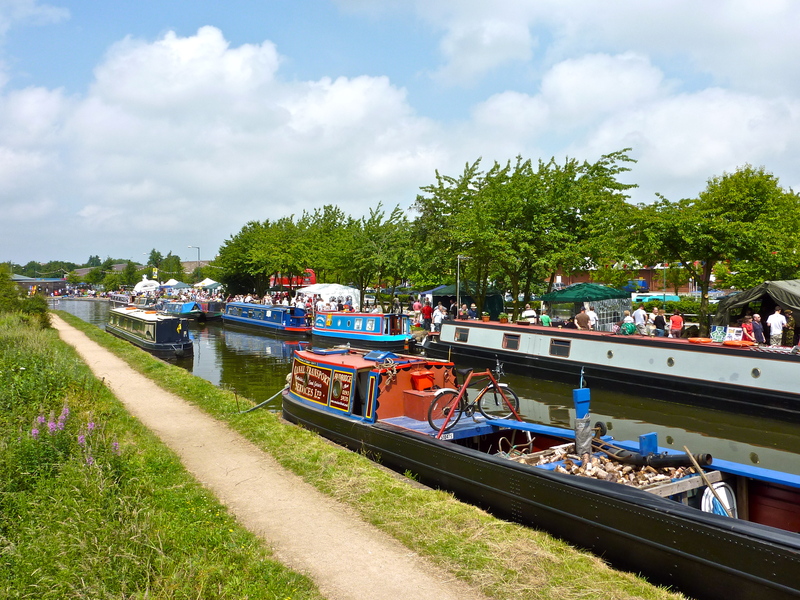 I’ve just noticed that the Brownhills annual canal festival is taking place this Sunday, 27th June, from 10am to 4pm. It takes place on Silver Street, by the canal opposite Tesco. There will be the usual mix of stalls, activities and attractions, and a good time is set to be had by all, especially so considering the fine weather predicted. It’s a great event and a cracking family occasion for all ages. Get your backsides over there! Last year's festival was wonderful - this one will be even better! I’d just like to point out to the organisers that there’s absolutely no publicity about this event on the web, and as yet, I’ve seen nothing in the local media. A search for ‘Brownhills Canal Festival 2010‘ turns up very little, and a search of the Walsall Council website turns up even less – their events calendar for Brownhills appears to end last Christmas. More worryingly, a Google search turns up second hit an erroneous and incorrect, somewhat alarmist Express & Star article questioning whether the event will go ahead at all. Publicity, folks, otherwise it’ll die like other Brownhills events. I know some of the dedicated folks behind this fine event read the blog, how about dropping me a line in future and I’ll publicise your stuff here. It’s all about Brownhills, after all. Brownhillsbob at googlemail dot com. This entry was posted in Brownhills stuff, Events, Express & Star, Followups, Fun stuff to see and do, Just plain daft, Local media, Shared media, Spotted whilst browsing the web, Walsall Council and tagged Brownhills, Brownhills canal festival, Brownhills Canal Festival 2010, Brownhills events, Canal, canal boats, canal festival, Doug Birch, Express & Star, Walsall, Walsall Council. Bookmark the permalink. 16 Responses to Brownhills Canal Festival 2010: This Sunday! I just like to say that I’ve always supported the canal festival, and indeed, last year featured a couple of articles on it. It’s a fine event and you guys behind it work hard and tirelessly to put it on. I don’t think it would hurt the council to publicise a community event like this – indeed, they have featured it in their diaries and glossy promo material before now. They claim to be fully supportive of Brownhills and it’s community, yet prevaricate over this. Sad, but telling. My concern was primarily that immediately that I posted about the event, I had a protracted conversation on Twitter with a boater based near Pelsall who was convinced the event had been cancelled. It took me 2 hours to find out that it hadn’t for sure, which involved asking someone currently in the town to look at Downes’s window for me. I then went and photographed it and posted it on twitter to prove it ( http://twitpic.com/1zsn6r ) I’m a dedicated nethead, a casual Googler would have given up. Since I posted about the festival, there’s now hard information returned in Google, displacing the cancellation story in the E&S. If you search their site, there’s no mention of the festival going ahead at all. Stuart makes some excellent points, and I’d add that whilst the organisation of such an event must be massive, sitting down for an hour or two and emailing as many events lists as possible – including Waterscape etc. works wonders. I’ll always be happy to push any event here. Over a thousand readers a week, mostly from Brownhills. Anything you want, drop me a line. Any help you need getting free webspace and suchlike, just ask. Best wishes for the event, it’s a cracker. Thanks Bob for highlighting this worthy festival – I had no idea it was on as I don’t usually read the E&S and don’t often have time to visit Brownhills despite having family connections there. I’m surprised this hasn’t been picked up by the Walsall Chronicle since it’s been in the E&S. Richard – I suspect you may be the Richard I know who is involved with the canal festival – if so and if you’re interested I can show you how to set up a free website for your event and forum, give me a call or email a.stuart.williams@gmail.com . Too late for this year but it might help in future. In any event, I recommend you let Bob here know about anything you want publicising – he does a great job for Brownhills online! I will try and get over there Sunday and take some pictures. Meanwhile I’ll give it a tweet. Good luck to all concerned – hope you have a great day for Brownhills! As every, the Tallygraph and it’s dedicattted Edittter to the rescue. Knowing how you support local events, Richard couldn’t find better advice and guidance than yours. Your words were kind and thoughtful, as ever. Richard is quite right. It’s not a council event although we have done our bit in helping to arrange a clear-up beforehand to smarten things up as much as we can. We’re always happy to flag up events on Twitter via @walsallcouncil and via Facebook. I’ve done this in the last 24-hours after being alerted to it. It’s unfair to call that ‘prevaricating.’ That’s helping out when I get to hear about it! Maybe next year, we can have a chat about how the council can help get the word out? Stuart’s offer of help in setting up a website is a really good one. WordPress is desperately simple to do once you know how. I’d also be happy to lend a hand to the organisers of the event too. They can reach me on 01922 653501 or via sleed@walsall.gov.uk. Hello Dan, it is the you getting to know about it that is the key. One could ask what elected members for Brownhills are there for if they cannot talk to you about this event? Equally so there are district centre managers are there not. Don’t they talk to you either? They b****y well should do if they do not. Events like this may be assisted by some WMBC money. However, that is in short supply, so WMBC expertise is probably worth more. Can you bang a few heads together? So, how did the community raise the money for the Miner? Door to door collections; buckets outside Tesco etc? I went today. Great event. It’s good to see a proper community event up the road in Brownhills and even better, centered on the canal system. I’d like to thank Bob for letting me know- I saw it in the press *after* it was posted here, and it gave us a chance to make our usual Sunday walk go past. I’d also like to offer any assistance I can with website type stuff: it can be very cheap, and there’s plenty of people about who could provide some help. A big thanks and well done to Doug, Richard, and all the volunteers. It must have been a load of work, and it’s really nice to see. Seemed well attended too, especially as I’m led to believe there was some sort of sporting event this afternoon. If you recognise your narrowboat, your stall – or yourself – please feel free to comment and/or leave details! This selection of photographs is copyright of myself, having taken them in support of the festival. They may be downloaded and used for non-commercial, promotional and personal purposes by the organisers, and by organisations taking part, as well as individuals pictured. re.. dan slee, i dont think richard needs any advise he looks to know the trade well.oh yes the council made a fine job of brownhills market “i dont think”….